Over the last few months I've been revisiting a number of "old faithful" locations, including 3 trips up North to Glen Coe in the last month. But while going back to locations that I know well, even somewhere as beautiful as Glen Coe, every so often I feel an overwhelming urge to explore somewhere new. Which brings me nicely to the Easter holiday last week. So last week 13 of us loaded up the cars and headed up to an old hunting lodge in Perthshire. To me Perthshire is a relatively unknown area of the country. I only know it as the place you have to go through to get to Aviemore, with only a few small villages and not much to see, and really only worth visiting once Autumn arrives - oh how wrong I was! It was only when I took the time to research the area and get my boots on and explore it that I realised just how much it has to offer. Our lodge was about 4 or 5 miles outside of Dunkeld, a long way up a narrow, steep and winding single track road. The first thing that struck me when I arrived at our holiday home was the view from the living room windows. We were looking South across the rolling hills of the surrounding farm land, down a deep valley with lochs along the bottom and up to the mountains in the distance. As soon as I saw it I knew it was the first place I had to go with my camera. In the morning I resisted the urge to indulge myself in long lie (after all, I was on holiday!) and I got up to brave the cold. After sneaking out of my room, trying (and failing - I think) not to wake up my cousin, I got wrapped up, filled my flask with tea and began the trudge across the moors. I'd been out there to explore the day before, to avoid making my way across the fields, trying to find the best locations in the dark at 6am. I found my way back to the farm building that I had planned to take my pictures from, and was lucky enough to find the fields full of sheep. Exactly the kind of Spring image I'd hoped to make! I had my camera set to go before the sun was up. After a short while of grasping my mug of tea trying to keep my hands warm, the sky began to fill up with pink light from the imminent sunrise. After consulting a map, I knew that I was looking South, in the general direction of Crieff, over the Loch of Butterstone and the Loch of the Lowes, famous for being the home to one of Scotlands breeding pair of Ospreys (which unfortunately I wasn't able to see). The sheep in the foreground and the soft light on the slopes of the valley brought together a really beautiful image that, to me, just screams Spring time. Exactly what I was hoping for! Once the sun had fully risen it lit up the dry stone wall in front of me. Thankfully the sheep stayed put long enough for me to get plenty of photos. One of the few places in Perthshire that I am familiar with is Kenmore, situated at the Easterly tip of Loch Tay where the Loch drains into the River Tay. I've photographed here a number of times before looking across the water towards the village, but one of the best features of the little bay is the island of trees just off the shore which I had never photographed before this particular trip. Further down the bank of the loch there is a reconstruction of a Iron Age crannog. A crannog is an ancient dwelling structure typically built on man made islands. There are a number of crannog sites that have been discovered in the loch and this island of trees is believed to be one of them. The site which is currently being excavated, on which the reconstruction is based, has been dated to around 500bc, but they are known in Scotland to have been dated as far back as 2500bc. 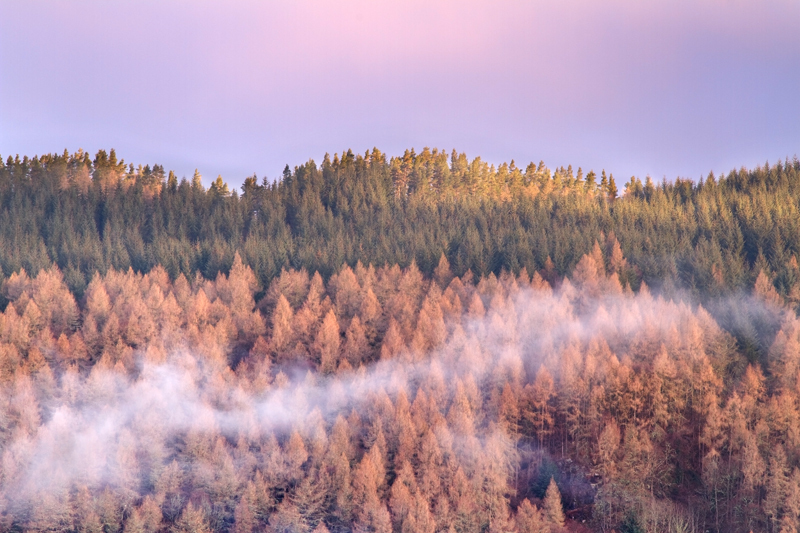 These 2 images are just little snippets of the Tay Forest Park on the hills above Kenmore. Taken only minutes apart, it's really interesting to see how the same landscape can differ so drastically, in a short span of time with just a subtle change in light. On my way to Kenmore I drove over the Glen Cochill road, following the line of the old military road, when I found myself in an extremely heavy downpour of snow, sleet and hail, which, in the black of night, made for a bit of an alarming drive to say the least! However, it did mean that on my journey back for breakfast I was treated to this sight of Loch na Creige. One of the places I knew I wanted to revisit during my holiday was Loch Tummel, in particular the Queens View Visitor Centre. On the evening I stopped here there was quite a heavy covering of cloud, but the sun did make a last attempt to break through before it disappeared behind the mountains on the North of the loch. The last rays of light made for a good picture, but unfortunately I still haven't been able to catch a glimpse of the summit of Schiehallion! The last place on my list of priorities to visit was the Hermitage Bridge in Dunkeld. The bridge spans over the River Braan which runs through the Craigvinean Forest. This spot is definitely going to be at the top of my list to return to when Autumn arrives! On the whole, my family and I had an amazing trip. Not to mention all the other great things that we were able to do during the week including things like the Blair Atholl Distillery and the Heathergems Factory. I can honestly say that I fell in love with Perthshire during my stay. To me if felt like the perfect blend of Highlands and Lowlands. With rivers and lochs, rolling valleys and towering mountains a plenty. Turns out Perthshire has a lot more to offer than I knew!